The new iPad will be available in black & white colors. There are two wireless options available: 4G LTE or Fast 3G HSDPA and DC-HSDPA. 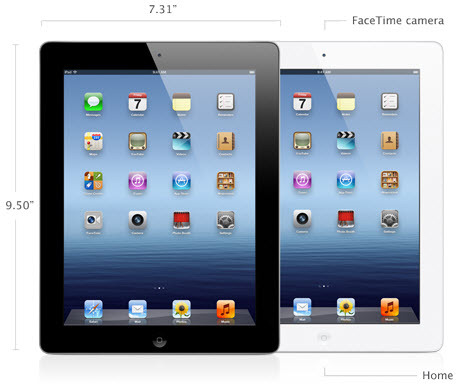 The thickness is 9.44mm and weights 1.4lbs, which is slightly heavier than iPad 2. New front-facing camera that supports Facetime. Carriers supported include Telus, Rogers, Bell, AT&T, and Verizon. The dock connector stays the same. There are no haptics built into the display, which was rumored. New iPhoto for iPad app ($4.99) with support for photos up to 19 megapixels. 10 hour battery life, 4 hours on the 4G model. iPad 2 (16GB) price drops to $399 ($100 off). The "ugly" is the new iPad has no name other than the "new iPad". Well that's confusing. You walk into an Apple Store and ask for a new iPad and I guess they'll sell you this one. 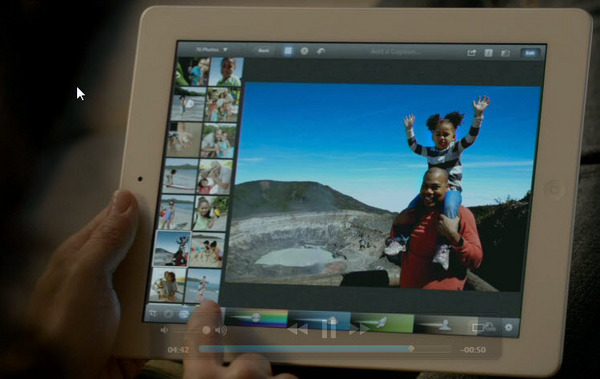 But when the next iPad comes out (iPad 4), you'll have to go into the store and ask for the new, NEW iPad. 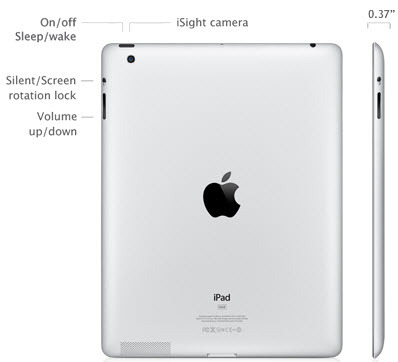 In any event, the "new" iPad will be available March 16th, but they're taking pre-orders now. Other features include sensors that include an accelerometer, GPS, ambient light sensor, and gyroscope. It also has Dolby Digital 5.1 surround sound pass-through with Apple Digital AV Adapter (sold separately). It also supported Bluetooth 4.0. Interestingly, no full-fledged version of Siri on the new iPad, though it does support dictation - sort of a Siri-lite on the new iPad. But no Siri web searches. The built-in hotspot feature is a pretty big feature. This will allow you to use your iPad as a WiFi access point that your other devices (laptop, PC, Mac, etc.) can connect to. This eliminates the need for specialty 3G/4G to WiFi devices like the Verizon MiFi, which have a monthly fee plus an upfront device cost. Update: Looks like the Apple Store is having an outage. Update 2: I'm still pissed Apple iOS still doesn't support Flash and don't give me the everything is going HTML5 nonsense. Yeah, I know. What happens tomorrow or next year doesn't help me today view embedded Flash videos on my iOS devices. I already ranted about this here and here if interested in reading my Flash on iOS rants. Transformer comes with mini-sd slot and mini-HDMI slot. New iPad (3) has neither. 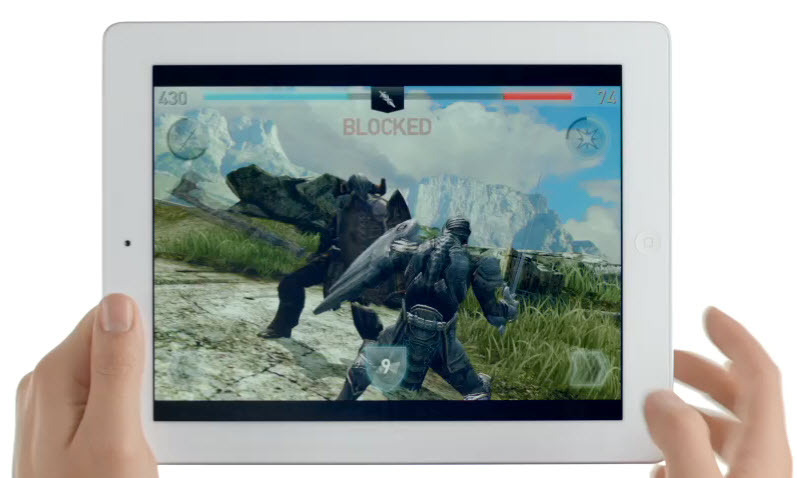 Transformer Infinity has an HD LED display vs. iPad 3's retina display. Slight edge to the Infinity. The Transformer supposedly has a wider viewing angle (178 degrees) due to HD LED display. 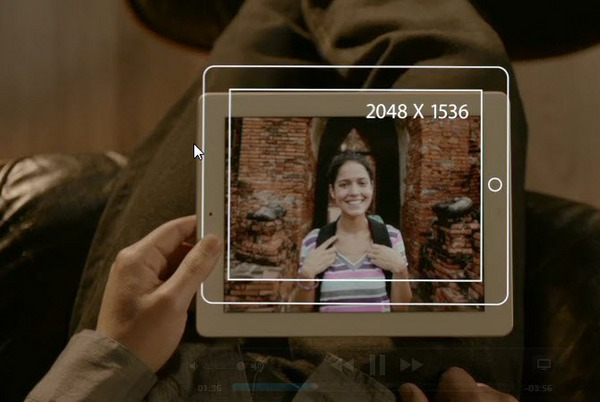 New iPad resolution 2048x1536 (264ppi) vs. Transformer Infinity 1920x1200 (224ppi) resolution. New iPad wins. 9 hours of usage on new iPad (4G) vs. 12 hours usage on Infinity. The Transformer is slimmer and is at least $100 less expensive. Transformer Infinity has a true 8MP HD 1080 rear camera vs. iPad 3 5MP camera. New iPad doesn't support Adobe Flash and doesn't have a flash for the rear camera, so you cannot take low-light pictures or video.